Let’s face it – owning a dog can be a bit of work to the point that some would even consider it next to human parenting! As a dog owner, you want to find some useful tricks and hacks that will let you take good care of your furry friends with ease. One excellent way to do so is by installing a dog door. With the best dog door installed on your premises, you’ll be able to provide your dog with more freedom to move around the house. It can also alleviate the need to get up every time just to let your dog in or out of your house. That said, it’s only ideal that you get a high-quality dog door which is easy to install, secure, and energy-efficient at the same time. In this article, we’ll walk you through some of the factors you have to consider when choosing a dog door on the market. We’ve also included several of the best dog doors out there. First of all, you need to consider the size of your dog when deciding on a dog door. Like you would with a dog crate or perhaps a dog bed, you need to make sure that the door you get is the right size for your dog. It doesn’t have to be perfect, but it should provide enough room for him to go through without any problem. Start by measuring his height and width. You can do this by measuring from the top of his shoulder down to the floor. You don’t have to measure from the top of his head since he’s just going to lower his head while going through the door. Meanwhile, for the width, you have to measure the widest point of his body, excluding the coat. After that, the next step is to get his weight. There are plenty of dog doors with weight restrictions, which is why weighing your dog is also important. Your goal is to get a dog door which is big enough to allow your dog to pass through. However, it shouldn’t be too large either, mainly because such doors will most likely require advanced features that tend to be costly. 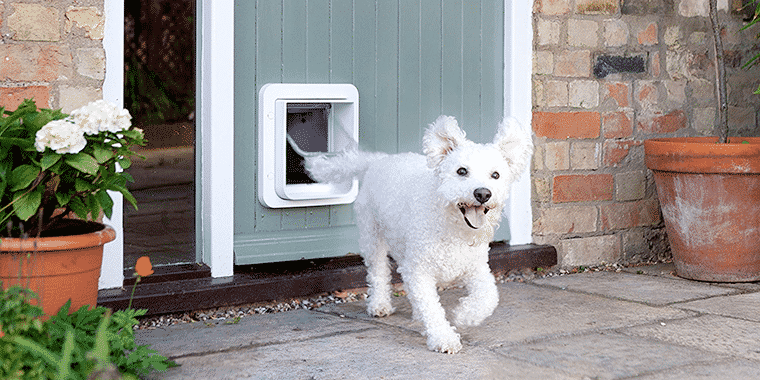 Most dog doors are fairly easy to install, although there are some which might take a bit of time, especially the ones with more advanced features. On average, you can install a dog door in just a few minutes without the need for any special tools or skills. When it comes to wall-mounted units, you need to cut a hole through the wall then attach the door properly. Most of the time, these units will require professional help to install properly. Sliding-door-mounted doors, on the other hand, will only take a few minutes to install – you can even do it yourself with just the help of a few tools. Since installing a dog door would mean adding an extra entryway into your house, you need to make sure that the one you pick includes a number of security features to help deter burglars or wild animals. A lot of dog doors on the market come with a locking mechanism to reinforce that. The problem is that the lock can only be engaged while your dog is inside, hence contradicting the purpose of a dog door which is to provide quick and easy in-and-out access for your furry friend. Most dog door manufacturers address the issue by installing smart features on their doors. These smart doors can read a microchip which is embedded in your dog’s collar. As a result, your dog can enter and exit the door freely while preventing any unauthorized entry. Moreover, there are products which can be programmed so you can control his entry and exit routine. There are two main types of dog doors: electronic and manual. Electronic doors tend to be the more expensive option. They normally come with a flap which automatically opens and closes each time your dog is near. There are even those with a smart key which you can attach to your dog’s collar. On the other hand, a manual door is made of either plastic or metal. It features a simple opening system, but you can also find other products with multiple flaps. For your dog to enter or exit, he simply has to push through the door’s flaps. One advantage of the electric variant is that it provides you with greater control over which animals can gain access to your house. Some brands even install their doors with a feature that lets the user set “curfew” times that automatically prevents entrance or exit on specific hours of the day. Unfortunately, since it comes with a lot of moving parts, an electronic door won’t last for long. Meanwhile, a manual door is a simple yet cheaper option. It might also be a more durable option. The problem is that you’ll have to manually activate the locking mechanism if you want to let your dog enter and exit of your house, or prevent him. One thing that makes a dog door really effective is its ability to block cold weather, thereby allowing you to save more energy. It also works to block hot weather during summer seasons. It is for this reason why you need to buy a dog door which has energy-efficiency features, as an energy-inefficient door or a poorly installed one could end up increasing your monthly energy bill. As long as you can get an energy-efficient door and have it installed, you don’t have to worry much about energy escaping from your house. 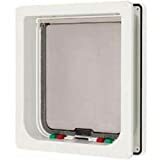 If you’re looking for an affordable dog door that’s designed to provide a simple yet reliable solution, then this door from Ideal Pet Products is a perfect choice. Its structural foam molded plastic construction makes it really durable and lightweight at the same time. Aside from that, it’s a very durable and energy-efficient option. It comes with an air pocket located between the double flaps to offer excellent insulation, thereby preventing any energy losses. Lastly, it’s available in four different sizes for you to choose from. 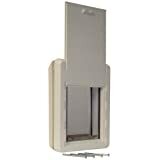 If you’re into a more secure solution, then the SureFlap door is a perfect choice. It comes with a microchip-detecting feature which prevents unauthorized entry into your house. You simply have to insert a microchip into your pet or use an RFID collar tag so your dog can enter and exit your house without any hassle. It’s also capable of storing up to 32 pets, making it the highest number that any electronic dog door can have in the market. Since it’s programmable, you can set a “curfew” time to control the time when your dog can freely enter and exit throughout the day. The Freedom sliding glass door from PetSafe aims to allow dogs easier entry and exit while being easier to install compared to most dog doors on the market. To install, you simply have to place the panel in your sliding door’s track to fasten it in place. Due to its design, there’s even no need to make a hole in your door or wall! As it’s made of aluminum, you can rely on it being weather-resistant. Moreover, its glass is made to be shatter-resistant. However, due to the PetSafe Freedom door’s single-pane design, it won’t offer the same insulation that a double-pane design door would. The High Tech Pet door is an electronic dog door that comes with a number of advanced features. 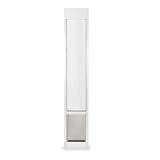 These include directional sensing to let the door know that your dog is approaching and an automatic deadbolt locking. Aside from that, the High Tech Pet door also has a 4-way access control which lets you decide how much access you want to give your dog. You can either grant full access, entry only, exit only, or have it completely locked. You may even adjust the activation range to your liking. Designed for medium-sized dogs, the BarksBar dog door can handle pets of up to 100lbs. As a no-frills door which provides quick and easy access to your dog, it surely is a lot more affordable if you compare it to the other products on the market. Just like most of the high-quality dog doors out there, the BarksBar door is fairly quick and easy to install, taking only around 25 minutes according to the manufacturer. It’s made of a plastic and aluminum lining for better durability. There’s even a self-locking panel to offer extra protection against the weather. If you don’t prefer transparent doors, then the plastic door from PetSafe could be the perfect solution. Due to its soft tinted flap, it’s perfect for providing an extra layer of privacy while its plastic frame is ideal for puppies who use the door less frequently. In spite of that, the PetSafe plastic pet door is certainly a very affordable option. It even comes with a manufacturer’s warranty despite being a less expensive option. 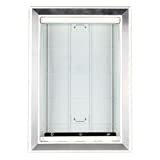 Another pet door from Ideal Pet Products, this one is a modular door which makes installation a lot quicker and easier. It’s basically the perfect option for dog owners who want to provide their dog with easy access every time. 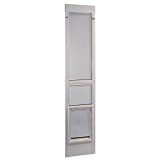 Due to its modular design, it can easily fit into any existing slide door. Moreover, it has an adjustable height along with a flap which can support dogs of up to 90 pounds. This dog door from Perfect Pet is a simple yet efficient option that will give your dog the freedom he deserves. It features the ability to create an air pocket that can help maintain the temperature of your house. Moreover, it has a sliding panel which you can easily lower to prevent your dog from going outside. As the name implies, this dog door from Dog Mate is designed for small dogs. It’s a sleek and stylish door which aims to provide easy access for your dog. It’s also very easy to install, not to mention it’s a budget-friendly option as well. Despite its very simple and basic approach, it can surely get the job done. The Dog Mate door also features sturdy locks that will prevent your pet from going outside if you want to. Meanwhile, its flap can help maintain the temperature inside your house and prevent the entry of bugs and water. In essence, a dog door is a bit similar to an invisible dog fence in that it can be used to prevent your dog from going beyond his limited area. However, it can also be used so that your dog can enjoy less restricted freedom whenever he wants. 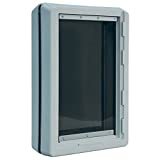 However, in order to make sure that your pet won’t have trouble getting inside or outside of your house through his own tiny door, you need to buy only the best dog door in the market.